Grab a pair of binoculars and a join park naturalist on his weekly Bald Eagle survey. 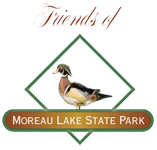 Moreau Lake State Park’s section of the Hudson is home to wintering bald eagles. It is important for us to monitor their population and health, please come and help us! Registration is necessary, please call 518-793-0511. $1 for 62+ and children, $2 for everyone else.